The side slipping you described might be due to the board being quite large. If you try a finless board that is narrower and longer you will see that the inside rail actually behaves like a fin as long as you slightly lean your body inside, it doesnt side slip unless you decide to (which is fun sometimes). Having said that, I understand that fins help a lot when waves get bigger, as you can really rely on them. Escribe en español and I will give it a try, "to get the rocker and that flex I have to cut the wood in contraction direction to the feed, if I do not give fiberglass part by just touching it", but I understood it as needing fiberglass to maintain the rocker. I have not had time to try the last paipo of 18 width that I have made. but what measures do you recommend me to go without fins, if board of paulownia is 18mm thick = 0.7in? no he tenido tiempo de probar la última tabla de 18 de ancho que he hecho. pero que medidas me recomiendas para ir sin fin, si el tablero de paulownia es de 18mm de espesor=0.7in ? I am 1,66m, my board is a 1cm tick varnished plywood board, no rocker, flat bottom, 120x40cm. I surf small to medium size waves, so far it works pretty good, very easy to catch waves, even the small ones. It is faster than a bodyboard, especially in longboard type waves, and not too much side slipping. I have had some fun micro barrels with that board. It is basically just a flat planing surface, but it fits well with the kind of waves I am confortable to surf. "I did try an HPD paipo..."
Never an HPD but made same outline out of plywood once. Seemed to me that the board required huge body position shifts so that my hip was always almost right on top of one rail or the other and hand on airborne rail used to drive the weighted rail into the wave face. That way, the thin edge could act as a fin but there was a heck of a lot of board up in the air most of the time. My thought at the time was this would be what Dorothy felt like had she tried to ride the barn door in the tornado on her way to Oz. Since the waves I first tried it in were 6-8 foot face, dredging sand barrels at local beach break, my thoughts weren't that coherent though, more like, "GLUB-GLUB Dorothy! Cough Gack Oz!" GeoffreyLevens wrote: "I did try an HPD paipo..."
Many different waves out there and many different people riding their paipo boards on them, whether it is a local wave break that a person may not venture far from or a faraway wave that is traveled to, and everything in-between. Young 15 year olds to older 75+ year olds, super fit and healthy and sluggish and chunky and everything in-between. Cold water and hot water, heavy rubber and virtually skinless, and everything in-between. Thin finless ply to thick super multi-finned EPS glassed boards, and a lot in-between (one more refrain!). And many different riding styles. The no rocker issue - some rocker helps but the boards flex is an aspect. I have a fibreglass board with no rocker and it nosedives once the wave gets hollow. Donostia - I've been there 4 times but never surfed there. That footage shows a variety of waves. The bodyboarder's wave would be better suited for a bellyboard. The fuller, slower/closeout waves would be harder on a ply board. Nice waves in the video ! Now I understand why you need some rocker. zensuni wrote: Nice waves in the video ! Nice boards, interresting fins setup, 2 parralels longboard fins ? IMO Finless craft of most types require more patience and water time before their benefits become worth it. Last edited by asier esnal on Tue Dec 11, 2018 3:15 pm, edited 1 time in total. Give Grame a call. He will also tell you that low inflation works much better than "inflated." Does not have any model leashes? and if a very fat wave comes and you lose it? you drown? no tiene ningún modelo leashes? y si viene una ola muy gorda y lo pierdes? tu te ahogas? I had a krypt surf mat for 2 years, I loved it, the learning process was quite hard (that was the "side slipping" part I was referring to), but after a lot of sessions I was as confortable rinding the mat than my paipo or my bodyboard. Then the krypt mat was destroyed (my fault), I bought a 4gears flyer omni surfmat, great quality mat, but this one is slighty bigger than the krypt, so now I have to get used to again (hello again side slipping). To my experience, mats may not look fun to watch, but are great fun to surf, it is a different glide, very subtle, kind of a "zen" thing. The downside is that it is difficult to duck dive a surf mat effisciently, so if no channel, paddling out can be a problem (no leash). But this is partly balanced by the fact than in case of wipeout you just "bear hug" the mat, you won't get hurt. Apparently wind is more of a concern than a wave, and duck diving is not easy. asier esnal wrote: Does not have any model leashes? and if a very fat wave comes and you lose it? you drown? asier esnal wrote: You said it right, there are 2 parallel longboard fins. 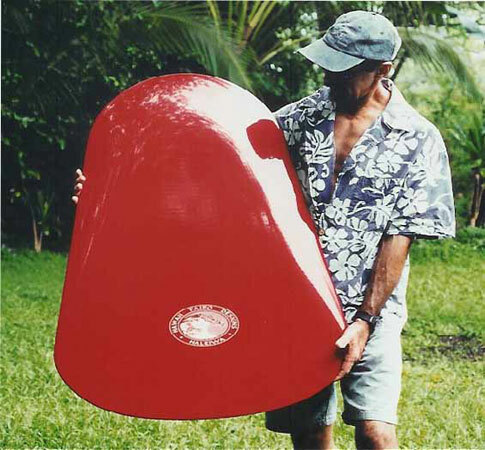 Single fins work, I rode a single fin paipo for a long time, during the late-1960s, 1970s, until maybe mid-1980s. On the other hand, the tail was somewhat narrower that what I evolved to with 3- or 5-fin setups. My single fins usually ranged from 8 to 6 inches, going smaller over time, and now I generally use a 4.5 inch center fin with two small side bites or 4 small runners (Bonzer). The really smart people would talk about characteristics of a fin's shape, height, base length and "rake." And where it is positioned on the board. A standard long board center fin is not conducive to easy quick turns/pivoting, so it can feel stiffer. But the fin is good for projection. Even those little knubsters, with their long bases, are conducive to helping project in one's turns, those longer arching turns. A good center fin box where one can move a fin forward and aft also provides flexibility for adapting to varying wave conditions. As mentioned above, duck diving a mat is a bugger. BUT they have easily variable inflation. Paddle out very soft or empty (swim it out) if necessary, and get under white water no problem. Then a few puffs and ready to ride.